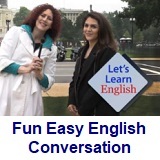 ﻿ Fun Easy English - new classroom free online classes english language lessons speaking listening writing reading march 8. 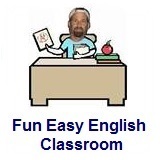 Today in the Fun Easy English classroom you will learn about fruits and vegetables. 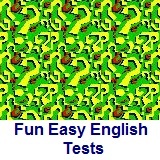 You will watch a video, use Fun Easy English flashcards, and take a test. Although the flashcards are for kids, still plenty of fun for adults too. Enjoy. Hi. In the classroom today you will learn about fruits and vegetables. The definition of a fruit is the ripened ovary or ovaries of a seed-bearing plant, together with accessory parts, containing the seeds and occurring in a wide variety of forms. Another definition is an edible, usually sweet and fleshy form of such a structure. The definition of a vegetable is a plant cultivated for an edible part, such as the root of a beet, the leaves of spinach, or the flower buds of broccoli or cauliflower. Another definition is the edible part of such a plant. If you go to a restaurant or a grocery store it is important to know the difference between fruits and vegetables. Visit a grocery store and make a list in English of the names of fruits and vegetables you find for sale. Return home and use a dictionary to determine which items are fruits and which are vegetables. This is a good way to increase your English vocabulary. Hey I know this lesson seems pretty basic but you would be amazed at the number of students who do not know the difference between fruits and vegetables in English. This is a test of your understanding of fruits and vegetables. For each question decide which word is a fruit and which word is a vegetable. There are 50 questions. Good luck. In this lesson Anna hires a trainer to get back into shape. Her trainer does not read her application carefully. So, he offers her a workout program that she does not enjoy. Anna: Penelope, even though we both love speed walking, could we slow down a bit? Penelope: No way! I think because I’m walking with you, I’m walking faster. Anna: Come on, Penelope. Let's take a break. We've been speed walking since 8 a.m.! You're so competitive! You even wore your medals! Anna: (chases her) Hey, wait for me! Hey, you know the speed walking rules! If both feet leave the ground, it’s running! You ran! Prof. Bot: Anna and Penelope are doing something they both love - speed walking! They are also using adverb clauses. Adverb clauses tell us when, why, how, where and under what conditions. For example, "since 8 a.m." tells us when. Adverb clauses are dependent clauses and need an independent clause to make a complete sentence. Words like before, after, when, because, since, if and even though can signal an adverb clause. Keep watching for more adverb clauses! Penelope: Whew! That was great! Anna: (Anna catches up) Wow, Penelope, you’re still really fast! Since I’ve been working in an office, my speed walking has been much slower. Penelope: You are slower, Anna. Maybe you should hire a personal trainer. Anna: That will be great. As long as the trainer understands speed walking. Penelope: (hands her a business card) Try this company. After you fill out an online application, they will match you to the perfect trainer. Anna: As soon as I get home tonight, I’ll do it! Thanks. Anna: Are you my trainer? Alaskan Albert: If you’re Anna, then I’m your trainer -- Alaskan Albert. Because I’m from Alaskan wilderness, I’m skilled in all outdoor activities of the wild. Anna: That’s great but what about speed walking? Anna: Okay … but seriously, when do we speed walk? Alaskan Albert: Your application did not say how funny you are! Anna: No. But it did say that I'm a speed walker! Did you read it? Forget it. We'll have to cancel. Anna: We can't train today because it's too cold and too windy. Alaskan Albert: No way! No pain, no gain! When you exercise in really cold weather, you feel alive! Anna: Really? Because right now I just feel cold. Alaskan Albert: You're so funny. But seriously, after our training, you will be ready for any extreme physical challenge. Let's get started! Anna: I'm bad at Call of the Wild Parkour because I don’t want to do Call of the Wild Parkour! (she howls) I am a speed walker. It’s what I do. It’s part of who I am. Alaskan Albert: Why didn’t you say something? Anna: I did. Several times! You thought I was joking. Alaskan Albert: Now I understand. Anna, I can help you., if you follow my advice, I'll put the speed back in your speed walk. Alaskan Albert: Go, Anna, go! Prof. Bot: For more about adverb clauses, visit our website!